Another great day of west winds, clean water, and diminished wave action equals to a great day of catching fish in the surf. The location of the activity moved up to the north end of Hutchinson Island, the Middle Cove beach access, and the pompano, whiting, bluefish, and blue runners were all willing participants. I was lucky enough to put together another limit catch of pompano along with a cooler full of big whiting and one bluefish. Sand flea scented Fishbites and clam strips fished 60 -100 yards off the beach was the ticket to success today. 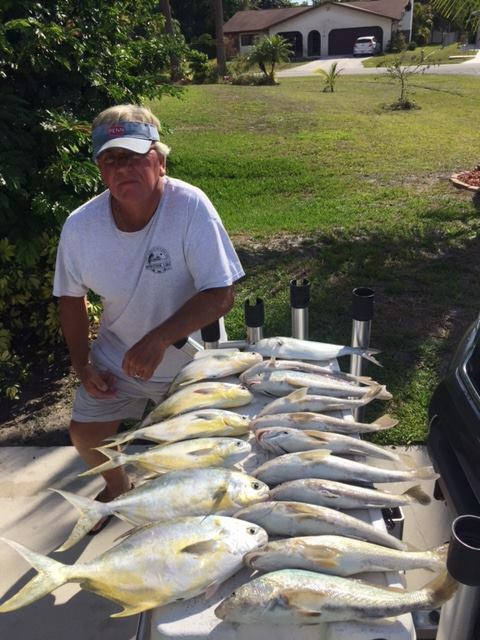 My friends, Chuck Frith and Marty Barlow, fished just south of me today and had a great catch of pompano along with some blue runners. Chuck did well today with the clam-scented Fishbites and clam strips. This stretch of good weather and favorable winds looks like its going to hold until late Saturday when the forecast is for southeast at 15 - 20 knots. These pompano are starting to migrate to the north so I wouldn't wait too long if you looking to put a few into your cooler. Good luck this week and catch em up.